If you are considering installing a new solar hot water heater it is important that you choose the correct sized system to adequately suit your hot water heating demands. Talk to Same Day Hot Water Plumbing & Gas today! Looking for quality solar hot water system in Kardinya? Talk to us at Same Day Hot Water Plumbing & Gas. Your Solar Hot Water System will be up and running in no time! Start saving electricity bills and install a solar hot water system in your home or business premises. Your Local Solar Hot Water Specialist – Get a Quote Today! Same Day Hot Water Plumbing & Gas is a locally owned plumbing company, who pride themselves on their local friendly service that is second to none. Solar hot water is becoming extremely popular around Adelaide due to it being the most cost effective and environmentally friendly ways to heat our water. With our energy bills constantly rising, a solar hot water heater could end up saving you over 60% off your energy bills per year and dramatically reduce your carbon footprint. Call Same Day Hot Water Plumbing & Gas today for the very best advice on which hot water system is most suitable to meet the hot water supply for your household or business. We can advise you on 3, 4, 5 and now 6 star energy efficient hot water units and the best water delivery rates, flow rates and temperature delivery to the various taps and plumbing fixtures around your property. Maybe you have solar energy electrical panels on your roof and your best option could be to install an electric storage hot water unit rather than a continuous flow instant gas hot water unit. A solar hot water heater is made up of solar collectors and a water storage tank. The solar collectors are installed on your roof in a position to best collect energy from the sun’s rays. This energy is then transferred to heat and pushed through to the water storage tank, heating the water stored inside ready for when you require it. Should you require any repairs to your current solar hot water heater call us on 0484 14 1111. We cover Kardinya & the surrounding areas with emergency 24/7 plumbing services available. 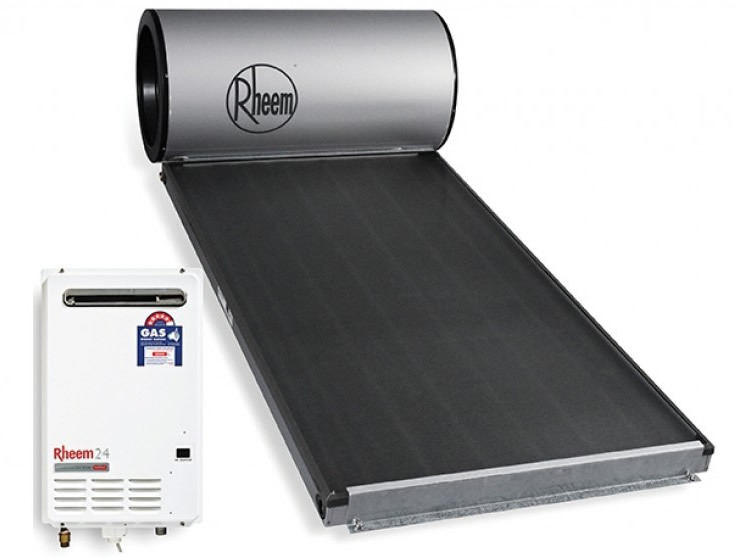 The split-system solar hot water design allows for the solar collectors to be positioned on your roof with the water storage tank located at ground level. The split-system design provides flexibility in installation and usually doesn’t require any reinforcements on your roof. 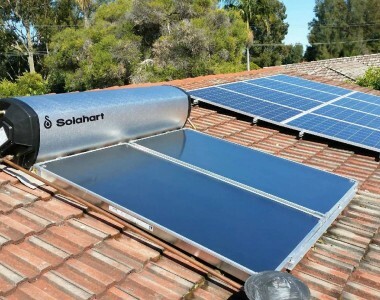 A close-coupled solar hot water heater has the solar collectors and water storage tank located together on your roof. A thermosiphon method is used, rather than a pump, to draw the collected heat inside of the tank to heat the water. The close-coupled solar hot water system has no moving parts, therefore requires less ongoing maintenance. Looking for a new SOLAR hot water system? Same Day Hot Water Plumbing & Gas provide the highest quality solar hot water services to our valuable clients. Whether its and emergency situation or a pre-planned installation of Solar Hot Water System, we are always up to cater to all of your plumbing requirements. We are fully licensed and insured to tackle any plumbing services you may require. We offer a complete set of services including installation, repairing and maintenance of Solar Hot Water System in Kardinya. For urgent hot water repairs in Kardinya and the surrounding areas, look no further! Services Includes: Solar Hot Water Installation, Solar Hot Water Repairs, Solar Hot Water Replacement, Solar Hot Water Servicing.